Learn to make Tandoori Paneer Tikka Recipe – 4 Ways ( in The Oven, Tawa, Grill) with a simple recipe video tutorial. Tandoori Paneer Tikka is the perfect starter/appetizer and even a great dinner for tandoori tikka lovers. In India, a party without tandoori starters is not a party at all. Be it a get-together, barbeque, or dinner parties, tandoori dishes are a must. This is a great starter option whether you’re feeding to a crowd or simply feeding your family. Your guests will surely relish the real flavors of this paneer tikka utterly, so be ready to hear some wows! When we talk about starters or appetizers, then one of the first dishes which comes to everyone’s mind is tikka. Here, Tandoori Paneer Tikka is especially favored, because it has that ideal mingle of spices. The smoky flavor of the marinated and tandoor-cooked paneer is simply jaw-dropping. Hard to describe in words, one has to taste it to live that inexpressible feeling. 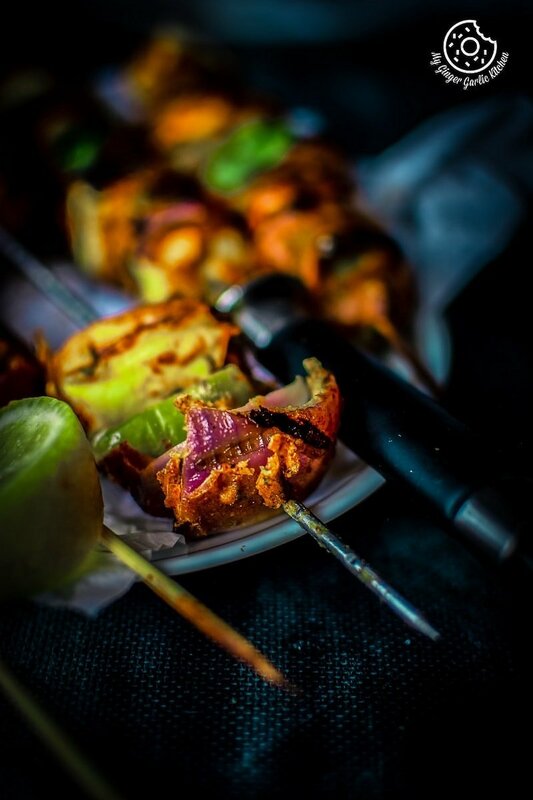 The recipe I am sharing today is the best Tandoori Paneer Tikka you will ever cook at home. It has the same taste you get at your favorite restaurant. And the good thing is that this recipe can easily be replicated at home without a tandoor. 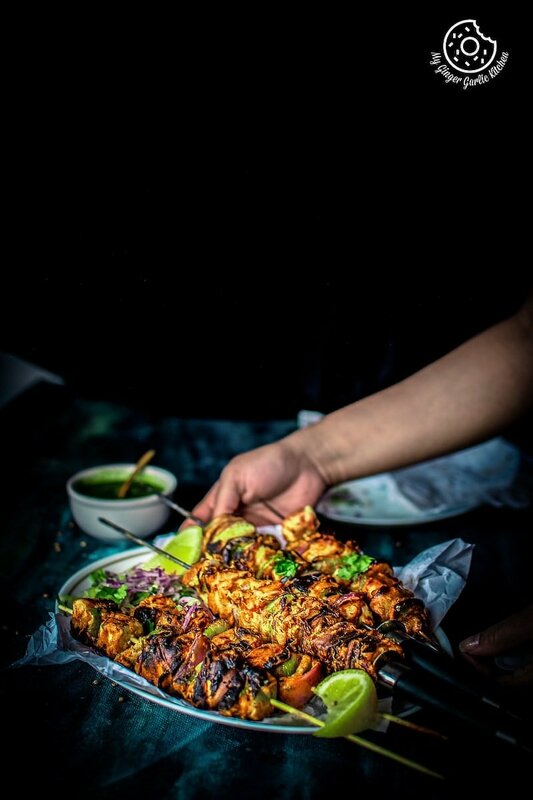 Yes, it is possible to have that restaurant style taste in Tandoori Tikka with the simple kitchen gadgets you have such as, tawa/pan, home oven, panini/grilled sandwich maker, or just with a simple disposable grill. So in short, roasting a tikka to the charred perfection is very much possible at home. 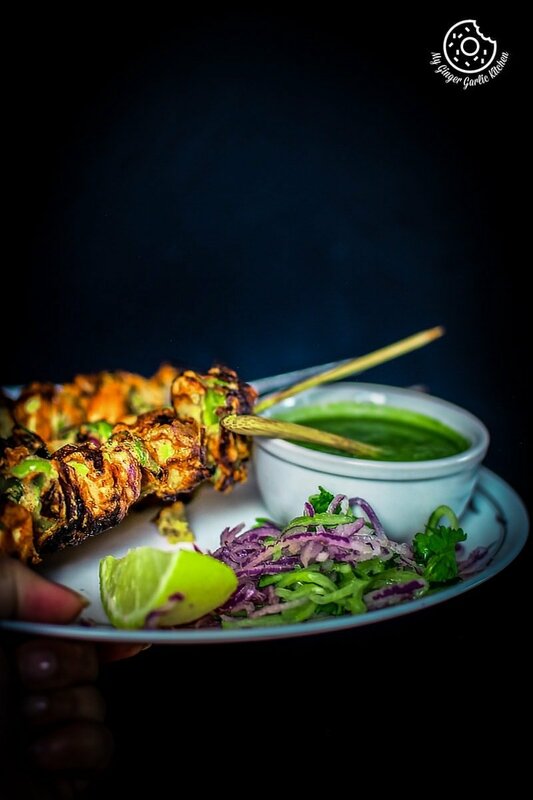 I love the homemade tandoori paneer tikka because it is so easy to prepare, and tastes so incredible just like you get at the restaurants. 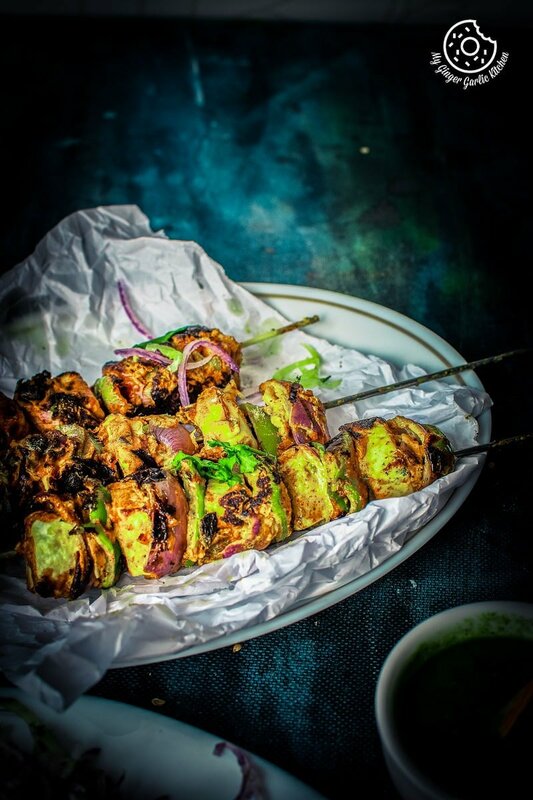 Many of you might wonder about ‘what is paneer tikka’? This post explains everything about paneer tikka such as how it is different from paneer tikka masala, many possible ways of grilling it, etc. This is one the most favored menu items at the Indian restaurants worldwide. This is one of such dishes which you usually find at any Indian restaurant, small or big. Moreover, this dish is mostly the star-of-the-menu dish. Thus this will be at the top of the menu list. 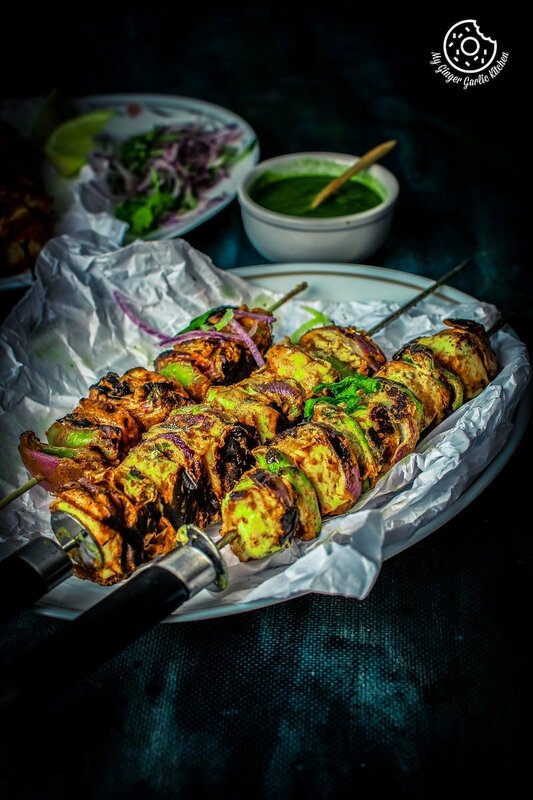 Paneer Tikka is an Indian appetizer where paneer chunks are marinated with fiery yogurt mixture and then it is authentically grilled in a Tandoor, which is a name for the traditional North Indian clay oven. 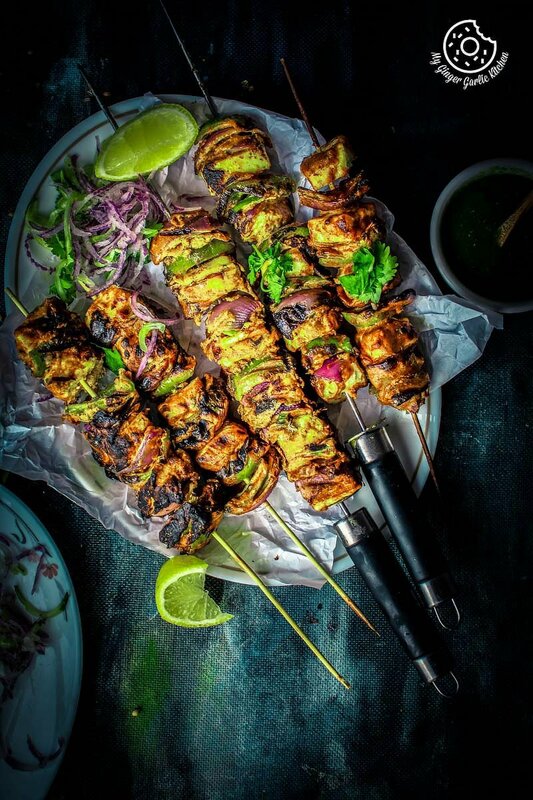 Paneer Tikka is a great vegetarian alternative to the non-vegetarian dishes such as Chicken Tikka, Fish tikka, or any other satay. 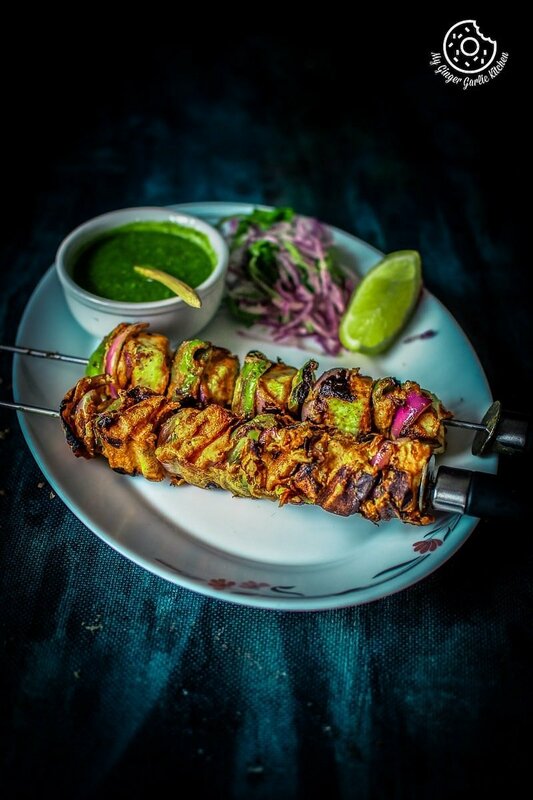 Tikka is a dish made with small chunks of meat/vegetables which are first marinated in a spicy yogurt mixture and then roasted in a clay oven. What is Paneer? What is paneer cheese made of? Paneer is an Indian version of cottage cheese which is made by only 2 ingredients. You curdle full cream milk with any of the following agents: lemon juice, white vinegar, yogurt or buttermilk. You can make it at home, or you can use the store bought. Here’s how to make paneer at home. First, you boil fresh milk. Add your desired agent, and allow milk to curdle. Drain the whey and rinse with ice cold water. Wrap it in a cheesecloth and put under pressure. Paneer is ready to use. Cut into desired cubes and make your favorite paneer dish. You can find the detailed version of homemade paneer recipe here. In many countries, you can get paneer at your local grocery stores. However, if you don’t find paneer in your local store, then you can easily buy it from any of the local Indian grocery stores. Paneer does not require long marinating time, just 30 minutes is all you need. This marination can also be done the day before, but it has to be refrigerated all the time. Add paneer to the marinade only 30 minutes prior to baking/roasting. Paneer tikka can be served as a starter or an appetizer. Simply sprinkle some chat masala and drizzle some lemon juice. Serve it hot along with green coriander chutney, or mint coriander chutney along with some sliced onions. The flavourful chutney and the crunch of onion would levitate the taste and flavor. Paneer Tikka is a dry dish which is served as an appetizer. Paneer tikka masala is a gravy dish made with paneer tikka. Paneer tikka masala is usually served with naan or rice. Cooking tandoori paneer tikka in the oven it still is a serious thing for many people in India. They are like helloooo!! Tandoori Paneer Tikka at home without a tandoor? In the home Oven?? In a Pan? In a Panini maker? Is it even possible? Yes, people are so sensitive about Paneer dishes, especially the tandoori ones. For many folks, it has to be just perfect the way they get in the restaurants. Many of my friends have been asking about this recipe for a long time, so here I am with 4 tikka roasting options for those who want a foolproof recipe. 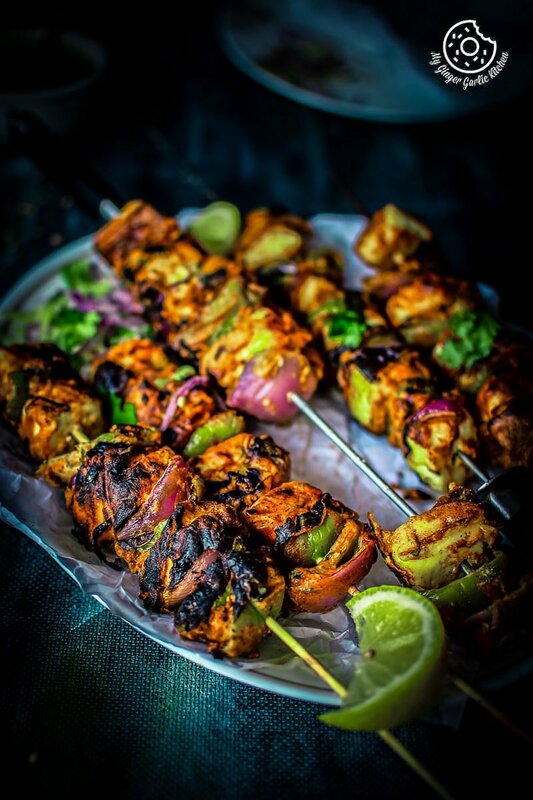 What is the ideal texture and taste of paneer tikka? In a perfect paneer tikka dish, paneer cubes have to be little crispy and charred on the outer surface. This charring gives that exotic smokiness in the dish. From inside it has to be silky, light, soft, and melt-in-mouth. Each and every piece of tikka has to be thoroughly marinated so that you get all the flavors well. How to marinate paneer for bbq? First, you make the marinade by combining the thick curd or hung curd as a tenderizer (full cream Greek or Turkish yogurt would work too), ginger-garlic paste, red chili powder, black salt, garam masala, pepper powder, mustard oil, chaat masala, and gram flour. I have added gram flour/ besan to the marinade because it helps in coating the paneer well. Beat it until smooth. Now add Kasuri methi, lemon juice to the mixture and mix well again. Add paneer and mix gently to coat the paneer well with the marinade and refrigerate for 30 minutes. Skewer it. Your marinated paneer is ready for grilling. Marinate the paneer and vegetables. 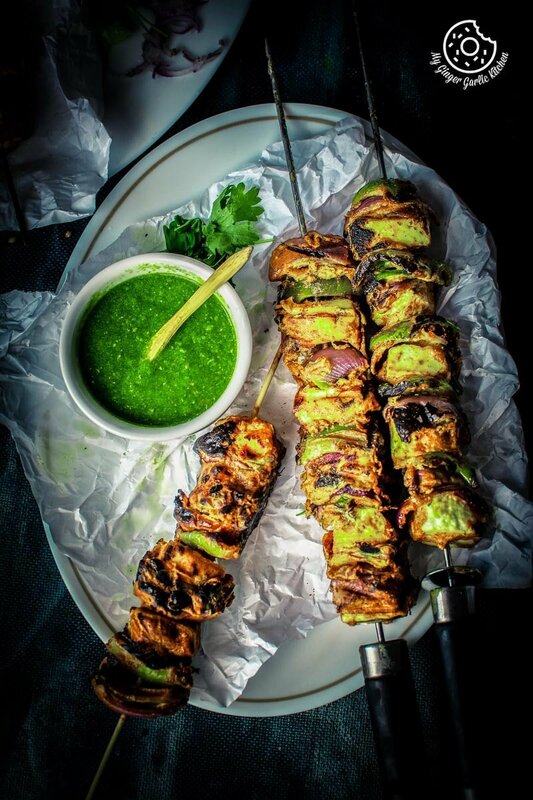 Thread paneer and veggies in a skewer. Roast/Grill (any of the following 4 ways will work). Bake it in an oven. Grill it in panini or sandwich maker. Grill it in an open grill. Isn’t it fairly simple and quick? Paneer tikka can be cooked on the stove top using a tawa or grill pan. It can also be grilled using an open grill, or panini maker. It can also be baked and then broiled in an oven. How to make paneer tikka in a microwave? Can I make Paneer Tikka in Microwave oven? Yes, you can. Marinade the paneer. Thread onto a wooden skewer. Brush all the sides with some oil. Arrange it on a greased microwavable plate. Microwave uncovered on high heat for 2-3 minutes. Flip and microwave again on high for 2-3 minutes and serve. This easy and quick Tandoori Paneer Tikka Tandoori Paneer Tikka Recipe – 4 Ways ( in The Oven, Tawa, Grill) shows, how you can smartly dazzle your guests by making this best-loved party starter at home — it can quickly and simply be made using a simple non-stick tava/tawa, or a grill pan. And that too, with the same charred perfection you get in the tandoori tikka. Tandoori Paneer Tikka is the perfect starter/appetizer and even a great dinner for tandoori tikka lovers. 1. Pre-heat oven to 220°C/ 430° F 10 minutes. 2. Arrange skewers on a baking pan. 4. After 15 minutes, take out the skewer. 5. Turn on the broiler settings on high. 6. Broil it on high for 1-2 minutes or till the paneer has a light char on the surface. 7. Carefully remove the roasting pan with the skewers out of the oven. < 1. Brush the grill plates lightly with oil. 2. 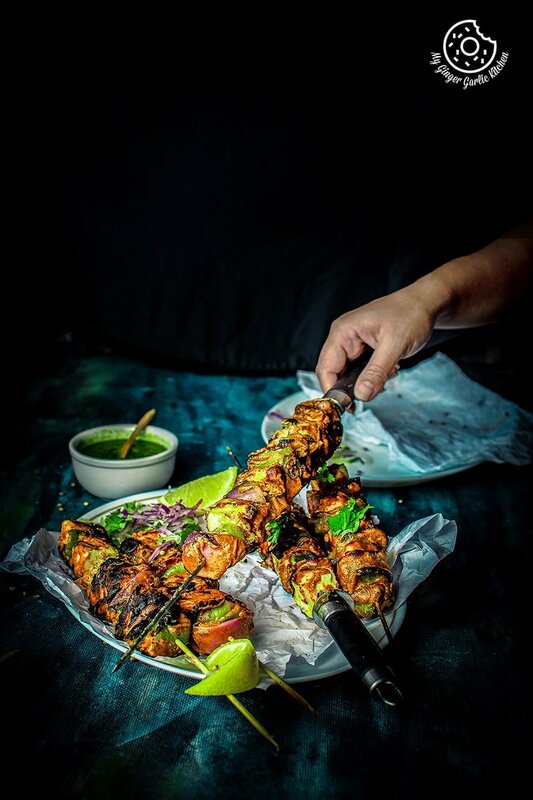 Once hot, place the tikka skewers and grill until juices run clear, or they are perfectly charred on the surface. It would take about 3-4 minutes on each side. 1. Brush skewer with oil. 2. Then grill the tikkas till char and cooked through. 1. Arrange skewers on a serving platter. 2. Sprinkle with some chaat masala and squeeze with a splash of lemon juice. 3. Serve immediately with sliced onions and green chutney. 1. We need solid paneer cubes for making tikkas, so always use the firm paneer, which is not crumbly. 2. You can swap Kashmiri chili Powder with paprika. 3. You can substitute hung curd with full cream Turkish yogurt or Greek yogurt. 4. Always soak wooden skewers in water for at least 2 hours prior to use.